This soup was the unintentional product of a side dish gone horribly wrong. OK, I exaggerate, it wasn’t that bad. It was just a little cauliflower mash that turned out a bit more like cauliflower baby food. 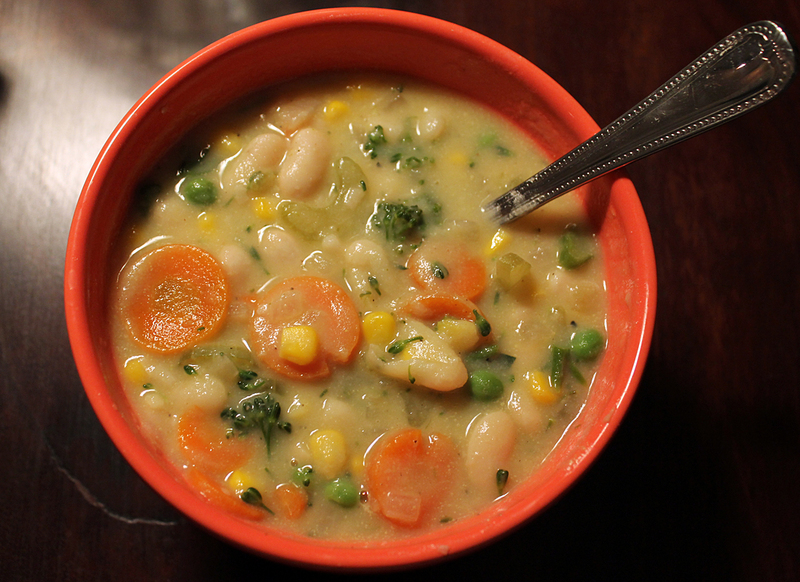 So, in my attempt to salvage a botched head of cauliflower, I combined the puree with some broth, added more veggies plus white beans, and the baby food became a creamy, velvety rich vegetable soup. Brilliant! One night’s kitchen disaster becomes something truly great and delicious the next. Love it. If you avoid dairy, try this the next time you have a hankering for something creamy and delicious. Between the cauliflower, the added veggies and beans, it’ll satisfy and fill you up on the good stuff. I used veggies I had leftover in the fridge and frozen in the freezer: broccolini, carrots, celery, peas and corn. Soup is the perfect vessel for cleaning out the fridge in a completely delicious and non-wasteful way. Sweet potato about to go bad? Chop it up and throw it in! You’ll feel so resourceful. Cauliflower, as this goes to show, is one of those magic veggies that you can turn into a number of things – roast it, mash it, rice it, puree it… It’s as if it were designed for cook-once-eat-twice cooking. You could roast a ton of it with chicken on Monday night, then take the leftovers and turn it into this soup the next. I love it when that happens… It certainly makes it easy to get another cruciferious veggie into your repertoire. Like it’s cousins (broccoli, kale and cabbage) cauliflower is high in vitamins C and K, so you get antioxidents and much needed support for your detox system. It’s also a good source of folate, potassium, iron and calcium. In a large pot, heat olive oil over medium heat. Add onions and saute until translucent. Add garlic and cook another minute. Add carrots and celery. Add vegetable broth and bring to a boil. Cover, reduce heat and simmer 10 minutes. Stir in cauliflower puree to combine. Add peas, corn, beans and/or any other leftover veggies that you’d like. Bring everything to a simmer to heat through. To make the cauliflower puree, cut cauliflower into pieces and steam 10-15 minutes, until tender. Place cauliflower in the food processor with three cloves of garlic. Add a little (I mean a little) water or broth and 2 tsp extra-virgin olive oil, salt and pepper. Puree, adding more liquid as needed until smooth and creamy. If you’re starting with roasted cauliflower, follow the same steps as above. You may need a little more liquid to get desired consistency. Next postWhat’s All the Fuss About Coconut Oil?